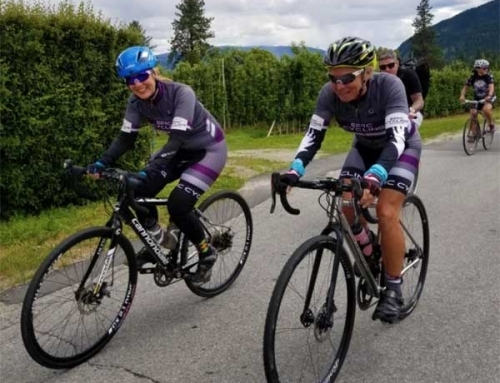 Penticton is a cycling city with scenic paths for easy rides, mountain trails for more extreme thrills and road courses tailor-made for road cycling. 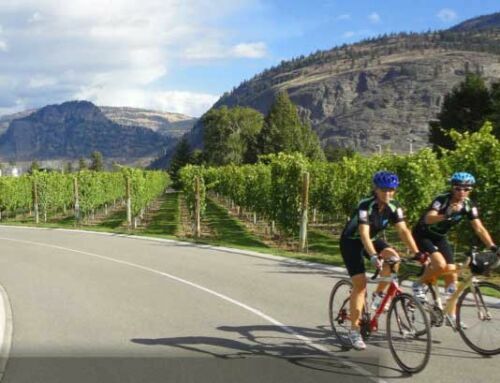 Come cycling with “Epic Cycling Penticton Wine Adventures”. Penticton hosts rock climbers from around the world. Skaha Bluffs is where they want to be. This series of cliffs that range up to 80m/250ft in height, present more than 650 routes, with challenges suitable for beginner to advanced climbers. Skaha Bluffs is the second-most popular climbing destination in BC. Easily accessible, just beyond the Penticton city limits on the east side of Skaha Lake, the area also offers many hiking trails. 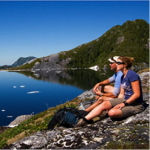 Both climbers and hikers are rewarded with amazing views of Penticton, Skaha Lake and the Okanagan Valley. The Okanagan climate makes Penticton an ideal place for golfing. Long dry summers and short winters with very little snow keep players on the course all year around. Penticton hosts the only Okanagan golf course that stays open year round. Play any one of a dozen courses within 60km/37mi of Penticton, four of them right in the city. The Penticton courses are generally laid out with easy walking in mind, with amazing mountain and lake views. The Penticton Golf Club opened the first 18-hole course in the Interior of BC. Since then it has shifted location and developed the course for championship play. The current location, adjacent to the Okanagan River Channel in the heart of the city, is flat – definitely a bonus for players used to the significant elevation changes of many Okanagan courses. Hiking trails around Penticton offer a variety of sights and challenges. Landscapes include orchards and vineyards, dry grasslands and ponderosa pine hillsides, clay banks and granite cliffs, and mountain lakes. Panoramic views take in the city itself, Okanagan Lake, Skaha Lake and distant mountain ranges. Trails provide opportunities for viewing wildlife both common and rare. In the city, take a stroll on the Promenade. It is a brick walkway along Okanagan Beach, or follow the paved pathway beside the Okanagan River Channel. Both are wheelchair accessible. Another paved path leads to a lookout on Munson Mountain, where there’s also a rough trail along the ridgeline with outstanding views of Penticton and Okanagan Lake. 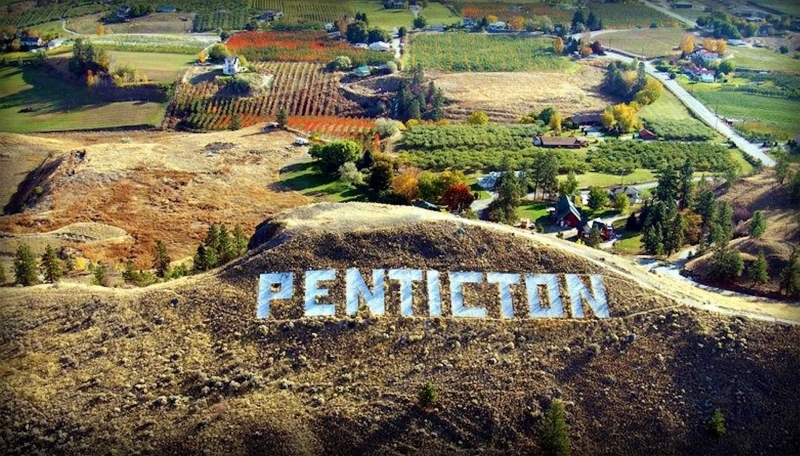 This is the site of a giant Hollywood-style “Penticton” sign. Penticton is developing a reputation among food lovers for it’s fresh from the farm and fresh from the oven delights. Who doesn’t love a good farmers market! Browsing through summer markets in the Okanagan valley, especially early in the morning, with the aroma of fresh brewed coffee in the air. Fresh bread, fresh fruit, fresh veggies, and all for purchase and to enjoy. Okanagan Valley farm markets are one of the things we anticipate, as the first signs of spring appear each year. You can find fresh market produce, organics, fresh fruit and vegetables, artisan goods, arts and crafts, freshly made and delicious baked goods, and enjoy local music and great entertainment. 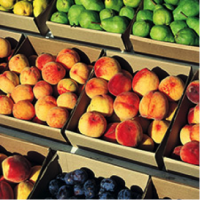 Farmers markets generally begin to open in April through October. These take place on Saturday mornings. Address: The Downtown Penticton Association operates the Community Market in the 200 and 300 blocks of Main Street and along Front Street. The Market opens at 8:30 a.m. and runs usually until about 1 p.m. Everything is fresh, locally produced or grown, and if you want local Okanagan fruit from the farmer’s markets you get the best fresh picked fruit in season. You can also find handcrafted original arts and crafts by local artisans. It’s a great place to find souvenirs or gifts. Cash is the general method of payment; be sure to have some on hand. Penticton is in the heart of wine country. It’s fun to get out and discover the wineries, see their varied styles and tastes. There are many differences between winemakers and growing areas. Sample the wineries of the west-facing Naramata Bench. Around Summerland the wines of Bottleneck Drive exhibit the flavors of the volcanic soil of Giant’s Head Mountain. Journey south to explore Corkscrew Drive in Okanagan Falls, Black Sage Road and the Golden Mile in Oliver and the wineries of Osoyoos. Be sure to take a guided wine tour with Epic Cycling! Breweries in Penticton produce a variety of traditional beers, including lagers, pale and dark ales, porters and stouts. For visitors and many of us locals, the Penticton river channel, fits the best definition of leisure and fun summer activities. It’s one of the hottest – or coolest. Penticton attractions and it’s free to float if you have your own, or you can rent through “Coyote Cruises”. The Okanagan River Channel, is a man-made water channel that was created in the 1950’s to control flooding and water flow from Okanagan Lake to Skaha Lake. 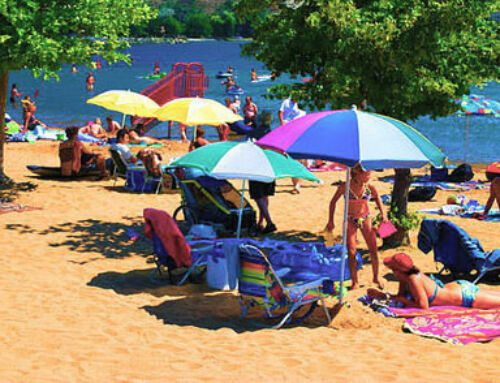 Today, it’s one of the most popular tourist attractions in Penticton, and a favorite for fun summer activities for kids and adults! The river channel is about 7 km (just over 4 miles) long, with a rest stop at the halfway point, at Green Mountain Road. So what does a Penticton BC vacation offer that the rest of the Okanagan doesn’t? Well, we think it is the most beautiful, family friendly city in the Okanagan Valley. No matter what you wish to see or do, you’ll find something here within easy reach. Geared for tourism all year round, the visitor oriented community offers all the conveniences of bigger cities, but without all of the big city hassles. And you really couldn’t ask for a better place to visit with kids. The slogan for this South Okanagan city is ‘A Place To Stay Forever’.